I've had the chance to spend a couple of weeks with the Dash Express GPS unit that most notably features two-way communication via Wi-Fi and GPRS for live active traffic data, Yahoo Local search instead of the standard list of points of interest and a robust customizable applications system. It was built to be the "commuter's navigation unit." One item I neglected to mention in the video is that the device has a very handy gas prices application built in. It can find gas stations and tell you the price for standard unleaded. It will also sort by price or distance and you can search other regions for gas prices, which could be very handy for road trips. 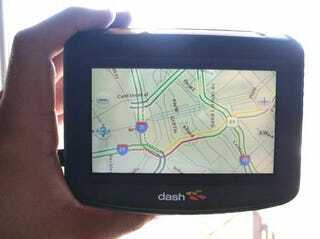 Overall the Dash Express was fun to use and provided more functionality that any other third-party GPS units we've seen. It does have its quirks; directing me to the wrong place once and having a very slow startup and satellite discovery time. The touch-sensitive buttons on the top were a bit of an annoyance as well. If you drive for your job in a major metroplex, this could be a lifesaver or it could be helpful in very large cities prone to horrible rush hours (like Dallas). Since it relies partially on other users for data, the larger the driving population, the better your unit will perform.